Apparently, I had died. The doctors told me “You went to the other side, you were gone, but then you came back”. Hello, my name is Yogamitra. I am a yoga teacher from Athens, Greece. I would like to share with you an amazing experience that happened to me when I suddenly became severely ill with meningitis and almost died. My story shows how yogic tools such as breath and the Sankalpa work powerfully to help us heal from illness, often in ways that are far beyond our understanding. The breath and Sankalpa are especially useful if they are combined with Yoga Nidra, which is a powerful relaxation and healing meditation. I had finished teaching a yoga class and was driving home when I started to sneeze continuously for about twenty minutes or so. When I arrived home I was not hungry and had a terrible headache. I told my daughter that I was not feeling very well and would go to bed early and rest. That night the headache became much worse even though I took painkillers. It was so bad that I could not sleep. The last thing I remember was attempting to get to the bathroom to vomit at 8 am. That’s all I recall before waking up four and half days later at 3 am in the intensive care unit of a hospital with my mother and my daughter staring down at me in tears. I regained consciousness and was shocked to find that a tube had been placed down my throat to mechanically support my breathing and other wires were supporting my heartbeat. I had lost all sense of place and time. Everything felt like it was at a distance and I was disoriented. The ceiling was moving to the floor, the windows were shifting around the room. It seemed the only thing I had was my breath. That was the first tool I instinctively started to use to try to regain some balance. I had been ill with meningitis, inflammation of the coverings of the brain. Apparently, I had died. The doctors told me “You went to the other side, you were gone, but then you came back”. I was kept in the hospital for three weeks. I used my mantra whenever I felt pain and Yoga Nidra to rest because I could not sleep. I was allowed to go home, but the doctors told me that I had a long way to go before I would fully recover. My nervous system was still in a mess. My memory and concentration were so damaged that I couldn’t remember everyday words, like “salt”, nor the faces of my friends, and I could not follow stories in movies or news items. Do not wait for an emergency or illness to start. Start working on yourself now. Start when things are rather easy! So then I started to use my ultimate yogic tool. 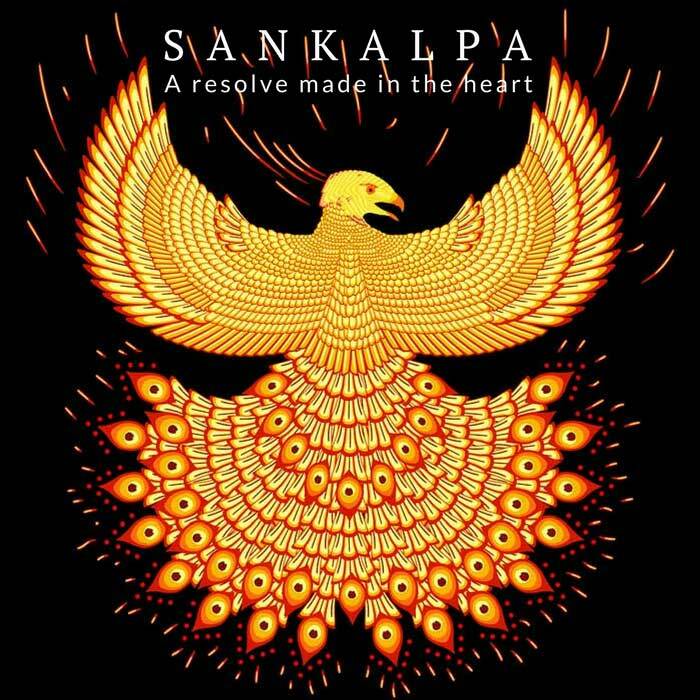 I am ever so grateful to both Swami Shankardev and Jayne Stevenson for making this meditation on Sankalpa; Illuminating Your Heart’s Desire. Since I could not practice yoga postures, nor sit cross-legged for meditation, I developed the habit of listening to these meditations through the day as I lay on my back in bed. At night, listening to this was the only way I could get to sleep. In the beginning, my mind was drifting apart but slowly I was able to concentrate for longer periods of time. I began to plant my Sankalpa, “I AM BECOMING STRONGER AND HEALTHIER”. 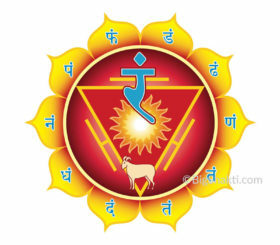 The Sankalpa along with the other techniques on the CD helped to bring me back closer to the strengths and abilities in myself. Every day I felt myself getting stronger and healthier. After ten days at home, I had an appointment to visit the hospital. The doctors were in tears after seeing how rapid my healing was. Once again they explained what had happened to me. “You left us for a time, then you came back”. I told them of my daily meditation process and showed them my progress. The doctors were so impressed with the effects that they asked me to start teaching the techniques to them. Since this is a unique set of techniques belonging to the authors Jayne Stevenson and Dr Swami Shankardev, I sought their permission and soon started teaching the doctors. Although I am now 99.9% recovered I still use the techniques from Illuminating Your Heart’s Desire frequently. It guides me through a process that helps me live my life more consciously united with my higher Self and less entangled in my lower self. Of course I still have lots of ongoing unresolved issues so I use this CD to help me to recognize them as they come to the surface. I continue to discover all kinds of aspects of myself and can observe them from the tranquil state that these techniques cultivate, instantly. 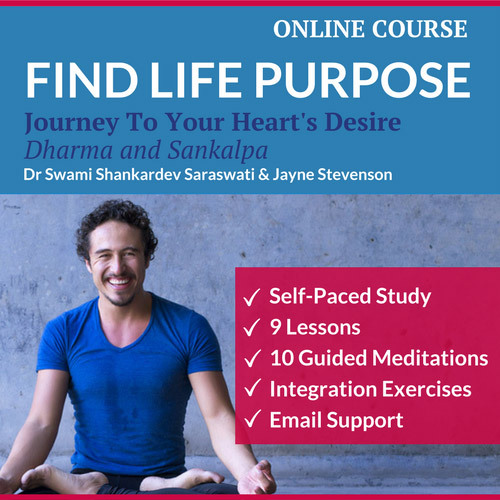 I regard these techniques and the incredible in-depth practices of the Find Life Purpose Course as a great gift to us all and that is why I am sharing this true story with you. Do not wait for an emergency or illness to start. Start working on yourself now. Start when things are rather easy! Self-paced study: 9 Lessons, Theory, 10 Meditation Techniques, 9 Integration Exercises, Teacher Support and CPD points.